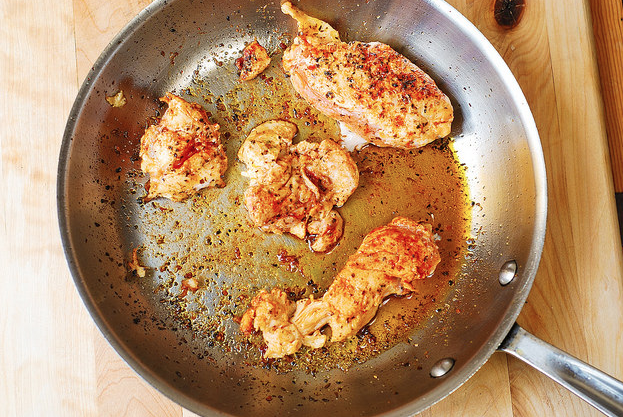 In this recipe, stove-top seared and spiced chicken is mixed with vegetables and bacon and then smothered in garlic cream sauce. 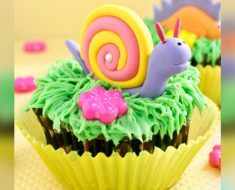 Oh, so good & very easy to make! It’s a gluten free friendly recipe, and all you need to do to make it gluten free is use gluten-free brown-rice penne pasta instead of regular penne. Add half and half and bring to boil. 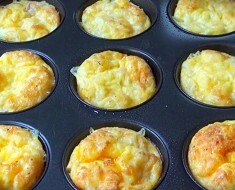 Only after half and half starts boiling, add grated Parmesan cheese – immediately reduce to simmer and stir, while simmering, until the cheese melts and makes the sauce creamy, only about 1 minute (at most 2 minutes). Then, immediately remove from heat. Season with more crushed red pepper and salt, if needed. 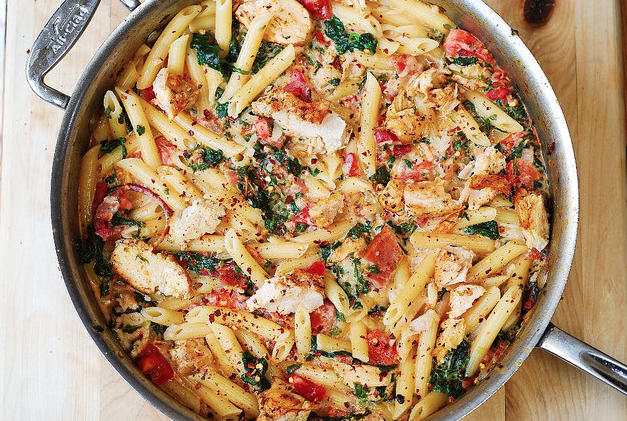 NOTE: Chicken and Bacon Pasta with Spinach and Tomatoes in Garlic Cream Sauce – delicious creamy sauce perfectly combines all the flavors: bacon, garlic, spices, tomatoes. 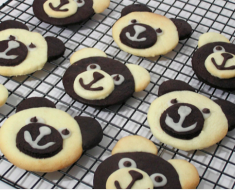 You might want to double this recipe! 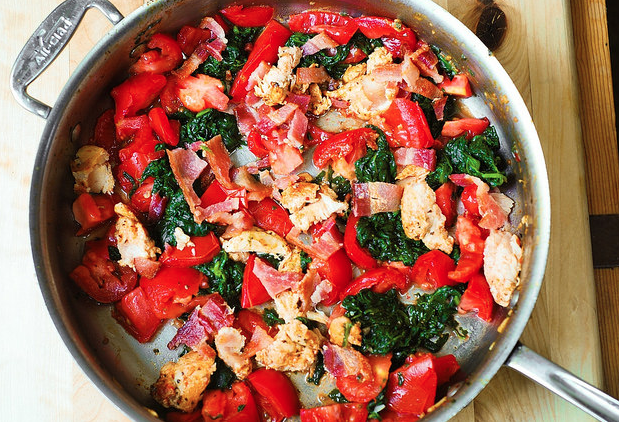 To the same pan (but without chicken), add chopped tomatoes, spinach, garlic, crushed red pepper, 1/3 of the chicken (sliced into small strips) and half the bacon (it should be already cooked and drained of fat). Mix everything. 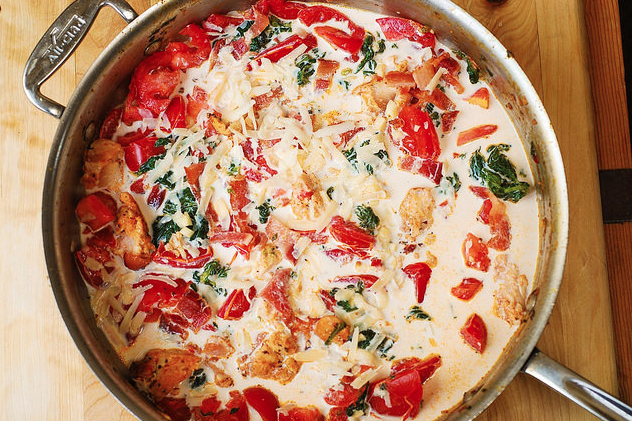 Immediately reduce to simmer and stir, while simmering, until the cheese melts and makes the sauce creamy, only about 1 minute (at most 2 minutes). Then, immediately remove from heat. Season with more crushed red pepper and salt, if needed. In the mean time, cook pasta according to package instructions. 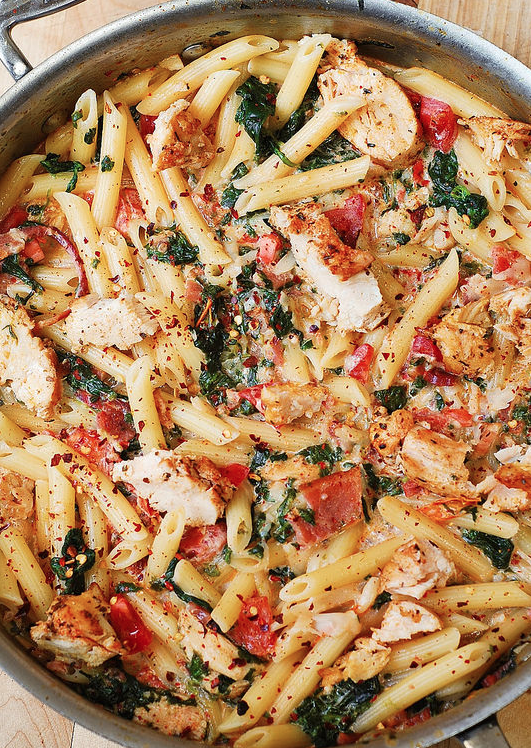 Add cooked pasta to the skillet with the sauce. Add remaining half of baon (already cooked and drained of fat). Season with more salt if necessary. Slice the remaining 2/3 of chicken into thin strips. 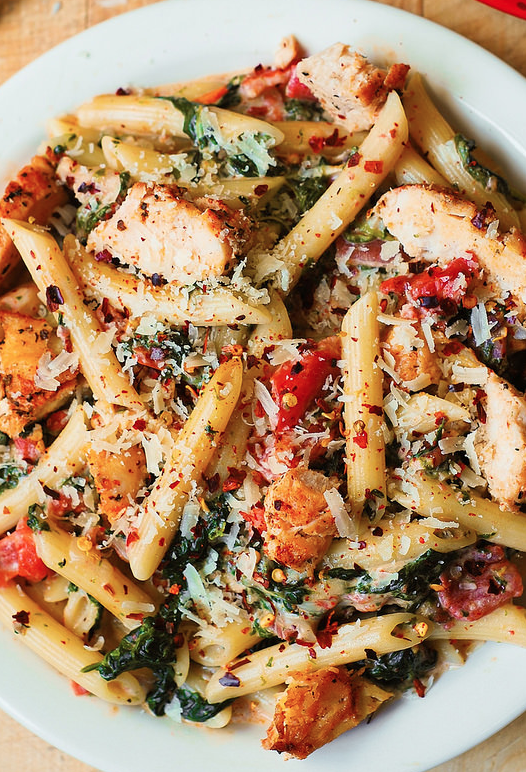 To serve, top the pasta with chicken strips and grated Parmesan cheese. 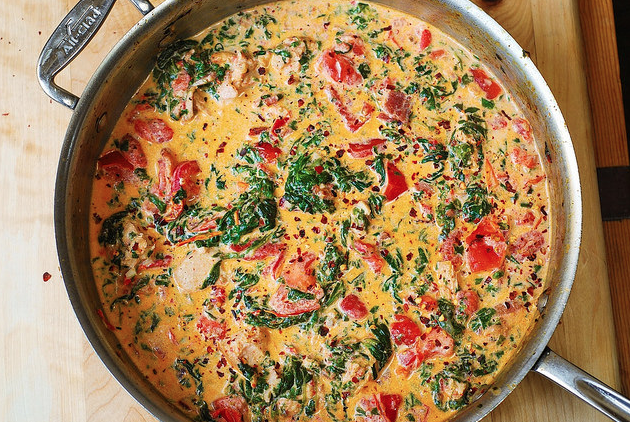 For another great fall meal, click here! 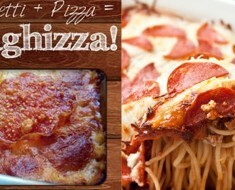 Spaghetti-Pizza Mashup Will Have You Saying YUM! 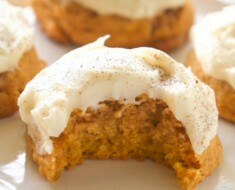 Pumpkin Cookies That Will Melt In Your Mouth! 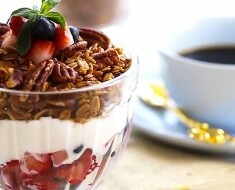 Delicious Homemade Granola Is The Perfect Way To Start Your Day!